Albert Tinkler is one of the men named on the Bottesford ‘church list’ of WW1 Servicemen. Albert Tinkler was the youngest child of Samuel and Priscilla Tinkler. His father was born in 1859 and baptised at Waltham in the Wolds, Leicestershire, on the 2nd January 1859. His mother was baptised on the 7th June 1863 at Denton, Lincolnshire. They married on the 9th October 1882 at Bottesford. Samuel Tinkler was an iron ore worker. In 1891, the Tinklers lived on the High Street, Bottesford, with four children, Jane (8), Ethel (5), Emma (2) and Harry (1). They were also living on the High Street ten years later, in 1901, when the children at home were Emma (12), Harry (10) and Albert (1). In 1911, they lived in one of the ‘Riverside’ cottages near Bottesford Rectory. Samuel was still and ironstone labourer, Harry was a domestic gardener and Ethel was a dressmaker. Albert was ten years old, a schoolboy. His service records still exist, and provide a good picture of this phase of his life. Albert Tinkler attested on the 29th June 1917 at the Recruiting Office in Leicester Market Place. He was 17 years 6 months old, working as a clerk at that date. His enlistment was finally confirmed on the 26th January 1918 when he had turned 18. 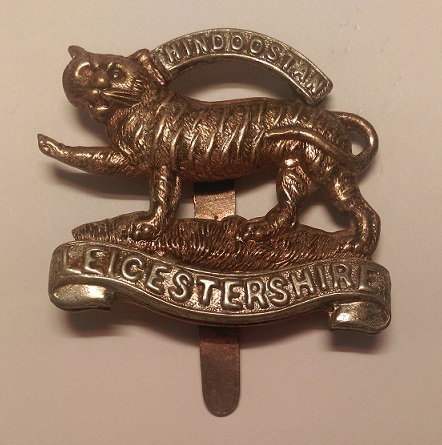 He was Private 24879(7) (the final digit of his service number was over-written on the attestation form), posted to the 52nd Battalion, Leicestershire Regiment, on the 11th April 1918. The 52nd Battalion was a training unit based at Witham in Essex, it was part of 218th Brigade in 73rd Division. In January 1918 it went to 207th Brigade of 69th Division at Clipstone Camp but by April 1918 had moved to Thoresby. In September 1918 it moved to 208th Brigade in the same Division and location (information from the Long Long Trail website). He remained in England through 1918, but was posted to Germany in 1919 to work at a military hospital. His records give very little information about his war service, only his misdemeanours! Albert was admitted to hospital suffering from German Measles in February 1918. He was admitted again, with influenza, in July 1918. However, this does not appear to have interfered with absences from camp at Thoresby. From the 20th July 1918 to the 21st July, 1918, he was absent from Tattoo returning at 9.30pm; on the 6th August he was missing from Battery Parade (3 Days CC) and on the 22nd September he was absent from Tattoo and seen by the Military Police and deprived of 2 days pay. Then on the 17th February, 1919, at Brocton Camp he was absent off his final leave and from Tattoo until ten p.m. on the 19th February, a total of 2 days. On the 22nd February, 1919, he was permanently compulsorily transferred to Leics. Regt. Authority. This was followed by posting to the BEF, arriving at Dunkirk on the 23rd March, and on to the 42nd Stationary Hospital at Euskirchen, Germany, on the 18th May. On the 10th July he was transferred to the RAMC, as 168900 Private, retaining his former rate of pay if “it was more advantageous”. From the 17th September to the 19th September he was once more absent without leave, this time for 2 days, and was deprived of 5 days pay for absence and breaking out of barracks. Then on the 2nd October, 1919, he was ordered to No 1 “Concentration Camp” for Demobilisation, had a medical examination at Euskirchen on the 24th October, and demobilised on the 25th November. Albert Tinkler married Winifred May Smalley, aged 21, in 1921 in the Grantham area. In 1939, Albert Tinkler, a domestic gardener, lived at Cottesmore Cliff Way, Bingham, Notts, with Winifred and widow Emma Smalley (Winifred’s mother). Albert’s mother, Priscilla Tinkler, was buried on the 24th February, 1937, at Bottesford, and his father, Samuel, on the 5th February, 1947, also at Bottesford. Albert died in 1967 at Nottingham, aged 67. Winifred died in 1989 in Nottingham, aged 89. His first service number is slightly uncertain, because the final digit was over-written on his enlistment document.